Place your order on-line and we will contact you via e-mail with your exact shipping charges. 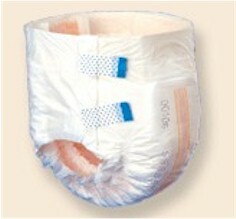 Disposable Children's Briefs provide heavy protection for any child. Junior size fits children weighing 28-42 lbs. and holds up to 10.2 ounces of fluid. These high performance briefs deliver superior absorbency. They were designed specifically to keep the user dry and clean for extended periods of time. The "Peach Mat Construction" guarantees skin dryness, odor control, bacterial control, and pH neutralization. The soft and comfortable design allows the user motion flexibility with the utmost of comfort. The refastenable tape tabs allow for multiple opening and closing of the brief. Latex free. Available in two quantity package options: 60 or 120. This product is available in four sizes: junior, x-small , small and medium . See chart below for sizing information. Need a size other than junior ? Click on the size links to view the other products. junior 28-42 lbs. 10.2 oz. x-small 18"-26" waist/hip 10.9 oz. small 24"-32" waist/hip 12.7 oz. medium 32"-44" waist/hip 20.4 oz.